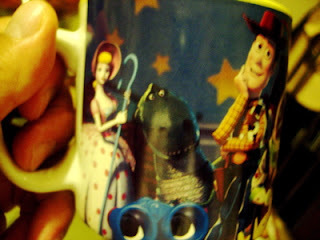 This is a Toy Story 2 Mug, which I bought at The Disney Store. 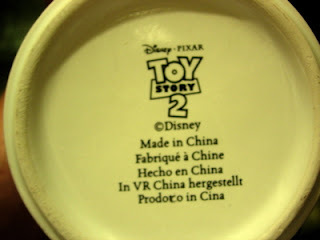 The movie "Toy Story 2" was a sequel to the blockbuster Disney/Pixar release, "Toy Story". This sequel actually out-earned the first movie at the box office. 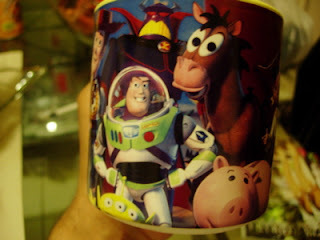 Ironically, "Toy Story 2" was originally going to be released as a direct-to-video movie, but the producers felt that it was SO GOOD that it could stand on its own as a feature. They were right! 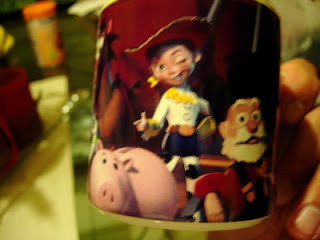 This mug features the characters: Bo Peep, Rex, Woody, Buzz Lightyear, Bullseye, Hamm, Jessie and the Prospector.